Development is a process that creates growth, progress, positive change or the addition of physical, economic, environmental, social and demographic components. The purpose of development is a rise in the level and quality of life of the population, and the creation or expansion of local regional income and employment opportunities, without damaging environmental resources. 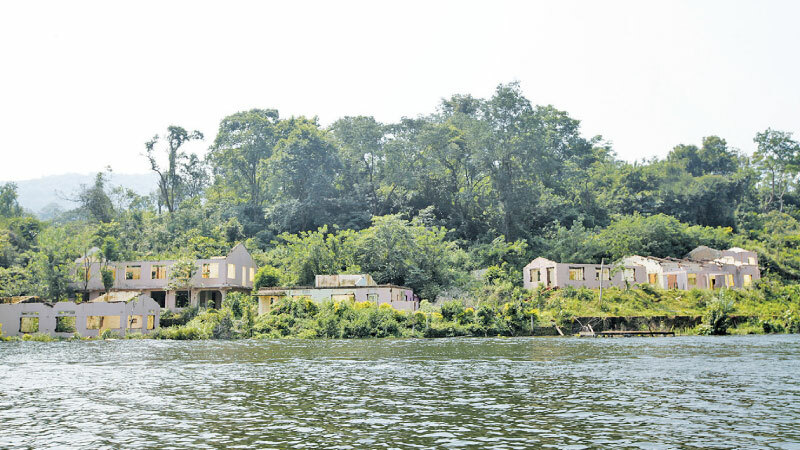 In line with the giant Moragahakanda and Kalu Ganga Multipurpose Irrigation Development Project, the old Laggala town had to be relocated as it was inundated by the waters of the Kalu Ganga reservoir. Therefore Laggala town has been relocated to a safer and more convenient place, with more facilities for dwellings and enterprises. The new Laggala town is significant since it is the first-ever green town in the country. Under the green town concept, everything has been properly planned in accordance with the needs and requirements of the residents. 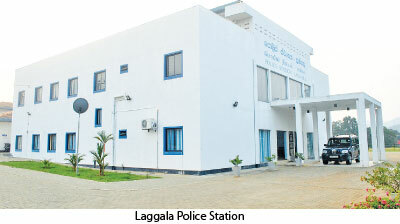 The government has set up 23 government institutions in the new Laggala town such as the Divisional Secretariat office, Pradeshiya Sabha building, hospital complex, bus station, police station, schools, health services centre, teacher training centre, post office, public fair, public playground, veterinary office, an Agrarian Services office, banks, a Mahaweli Authority office, and a veterinary office. Speaking to the Daily News, Laggala Divisional Secretary S.D.P. Jayasooriya said the people of Laggala are lucky to be able to attend to each of their needs quickly, as all the government institutions have been established within close proximity. Of the 23 government institutions, almost all are functioning well now, he said. The government has spent Rs. 2,045 million for constructing the new Laggala environment-friendly town, Project Director of the Moragahakanda - Kalu Ganga Multipurpose Irrigation Development Project, D.B. Wijeratne said. Over 3,000 families which lost their homes due to the Kalu Ganga project have been relocated in the new Laggala green town and its suburbs. Each family unit is offered half an acre of land for housing and two acres of paddy land. Every plot of land has all facilities such as electricity, wide access roads, and water. 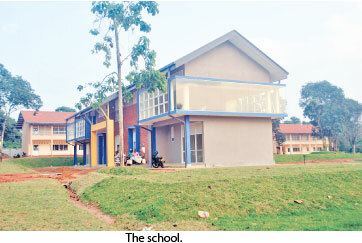 Residents also have easy access to schools, the playground, religious centres and much more. All the business ventures which were in old Laggala town have been relocated to the new town. Each businessman from the old Laggala town has been offered a six-perch plot of land in the new town for recommencing business. Wijeratne said that owners of every housing unit, business or other property received compensation prior to vacating the old Laggala town. A transparent and proper compensation system was carried out, he said. Moragahakanda - Kalu Ganga Multipurpose Irrigation Development Project Chief Residential Engineer A.K.D. 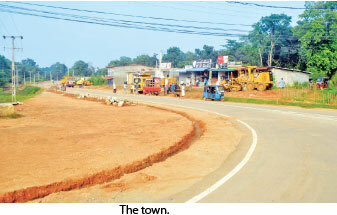 Tennakoon said the new Laggala town which was planned as a green town was constructed on a 75-hectare plot of land. Besides the 23 government institutions, four more institutions which come under the Mahaweli Authority will be located in the new town, for the convenience of the farming and irrigation sectors. “When planning the town, modern technology and concepts based on globally-accepted standards were used. All institutions such as business ventures, economic institutions, and community centres are located in a systematic manner. There are six banks in one location. Under the green concept, electricity for the entire town will be provided by solar power,” he said. When asked about garbage management, he said two systems for garbage management and sewerage disposal have been installed with the technical assistance of the Peradeniya University. Owing to the Moragahakanda - Kalu Ganga Multipurpose Development Project, the entire Laggala DS division has seen rapid development. Under the green town concept, infrastructure facilities have drastically improved, Laggala Divisional Secretary Jayasooriya said. “Earlier, the people of Laggala moved to other places because of the town’s poor infrastructure facilities. Moreover, public servants received punishment transfers to Laggala, since the town was among the most underdeveloped in the Matale district. But with improved facilities, people will no longer move to any other place. It is significant that the new Laggala green town is not an underdeveloped area anymore,” he said. Meanwhile, the construction of the Kalu Ganga irrigation project, which comes under the mega Moragahakanda and Kalu Ganga Multipurpose Irrigation Development Project, is nearing completion now. Kalu Ganga Development Project Residential Engineer Hemantha Dedigama said 90 per cent of the project’s construction has already been completed and the project is scheduled to be handed over to the government by December 25. "The Kalu Ganga irrigation project consists of two dams, including a main dam and a sandal dam. The construction of both dams has already been completed. 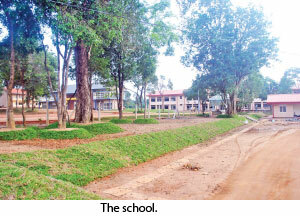 Therefore, 90 percent of the construction of the entire project has been completed,” Dedigama said. “Water filling has commenced and it is estimated that the reservoir would be completely filled before end 2019. As a general practice in the civil engineering sector, new reservoirs are filled with water gradually, with the monitoring of the strengths of dams and other constructions with the increasing water level,” Dedigama said. “The water capacity of the Kalu Ganga reservoir is 248 million cubic metres and of that capacity, eight percent (20 million cubic metres) has already been filled. The reservoir will be filled up to 218 metres above sea level and the water level at present is 170 metres above sea level,” he said. When asked about the progress of the construction of the canal system which links the Moragahakanda and Kalu Ganga reservoirs, Residential Engineer Dedigama said the two reservoirs are linked by two tunnels and two open canal systems. “The construction work of the conveyance system consisting of two tunnels and transfer canals is in progress and will be completed on schedule,” he said. “Once completed, the massive Moragahakanda - Kalu Ganga Multipurpose Irrigation Development Project would help us overcome the problem of water scarcity in five districts, that is, Matale, Anuradhapura, Polonnaruwa, Trincomalee and Vavuniya,” Moragahakanda and Kalu Ganga Development Project Coordinating Officer P.G. Dayananda said. Besides, the project will provide irrigation for agriculture, water for domestic use, and generate hydropower for a whole range of agro-based industries. Therefore, the project will provide irrigation facilities for 81,422 hectares in the Dry Zone, while providing industrial water supply to the many districts, including Anuradhapura, Polonnaruwa, Trincomalee, Matale, and Kurunegala. The Mahaweli Development Project is a significant development project in the history of Sri Lankan irrigation which the whole nation honours. The project which commenced at the end of the 1960s, rendered a great service for the economic development of the country, while initiating massive development across the country, he said. “The Moragahakanda and Kalu Ganga reservoirs, which utilise water from the Amban Ganga as the feeder river, are opening a new chapter in the country’s agriculture sector,” Dayananda said. With the completion of the Moragahakanda – Kalu Ganga Multipurpose Irrigation Development Project, a significant transformation will take place in the culture of the farming community in the country. Besides, the national economy will receive a great boost through this development project, President Maithripala Sirisena, who is the implementer of the project, said, at the opening of the Moragahakanda reservoir. “In the same manner, an agricultural revival will take place in the country, the fisheries sector will see development, and clean drinking water will be supplied to many people with the implementation of the Moragahakanda – Kalu Ganga Multipurpose Irrigation Development Project,” he said. 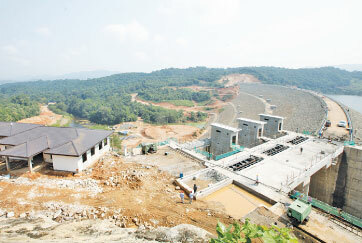 With the completion of the Moragahakanda reservoir, the ‘five mega reservoirs’ under the Mahaweli Development Project will be completed after four decades since the waters of the Mahaweli were first diverted to Rajarata from Polgolla on January 8, 1976. Providing drinking water for people living in Rajarata is important, since we now know that the cause of chronic kidney disease is poor-quality or unhygienic drinking water. Providing drinking water will be the ideal solution for the people living in Rajarata where the occurrence of chronic kidney disease is common.